A group of MHS sophomores created projects centered around financial literacy. Milton Hershey School students recently learned about financial literacy through a project-based learning activity in the school’s Legacy to Lead course. The class is designed to help sophomores develop a deeper understanding of the school’s founders, Milton and Catherine Hershey, and become successful public speakers. Through a project-based learning activity, students were tasked with creating a two or three-minute public service announcement about a topic related to financial literacy such as the importance of credit scores, how to apply for a loan, how to open a bank account, and how to avoid going into debt. Students shared their videos for other MHS students who want to learn how to properly manage money. Milton Hershey School partnered with Members 1st Federal Credit Union to help students learn about the banking community and collaborate with professionals as they created the videos. Members 1st staff were invited to listen to students’ presentations and provide constructive feedback. 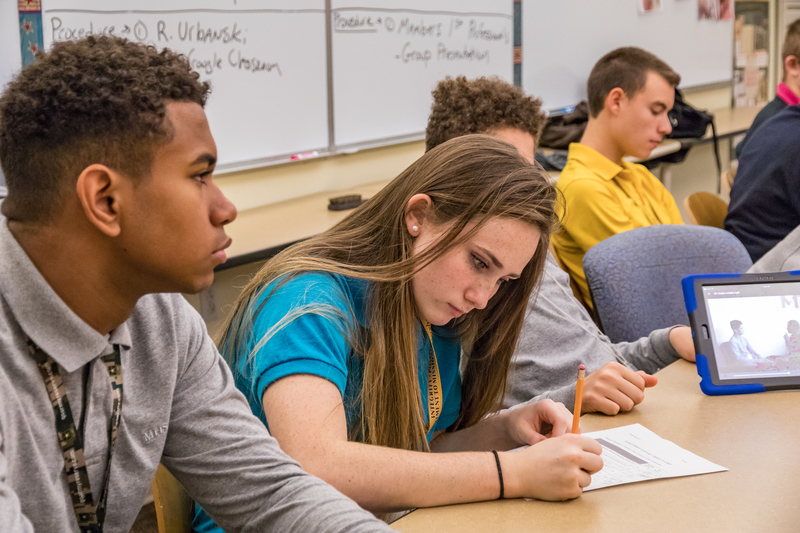 Milton Hershey School forms relationships with businesses and organizations in the community to provide project-based learning opportunities that allow students to see the real-world implications of their academic lessons.